I usually for butternut squash with a long neck and a small bulb so that you get the most squash and the least amount of seeds. For this recipe, I want the opposite—a larger cavity for filling and just a little squash to add to my stuffing. 2Line 2 baking sheets with parchment paper. 3Place wild and basmati rice in pot or rice cooker with water or stock and a pinch of sea salt. 4Bring to boil, reduce heat and simmer covered until liquid is absorbed (about 45 minutes). Remove from heat and set aside. 5Cut squash lengthwise so that you have one piece that is more than half (about two-thirds) and the other about one-third. 6Scoop out and discard seeds, and rub larger piece with 1⁄2 teaspoon olive oil. 7Place flesh-side down on prepared baking sheet. 8Peel other piece and cut into 1⁄2-inch cubes. 9Place cubes in bowl, toss with 1 tablespoon olive oil and spread in single layer on second baking sheet. 10Roast both 35 minutes or until tender. Remove from oven and set aside. 11In cast iron skillet over medium heat, sauté shallots and garlic in remaining 1 tablespoon olive oil until soft (about 2 minutes). 12Add celery and sauté 2 minutes longer. Crumble tempeh and add to pan. 13In bowl, combine lemon juice and maple syrup and pour over tempeh. 14Fold to combine and continue sautéing to heat through. 15Fluff grain and add to tempeh mixture. 16Fold in pepper flakes, cubed squash and parsley. 17Scoop out the roasted squash leaving 1⁄2-inch of squash plus shell. 18Fill squash with stuffing allowing it to overflow generously. 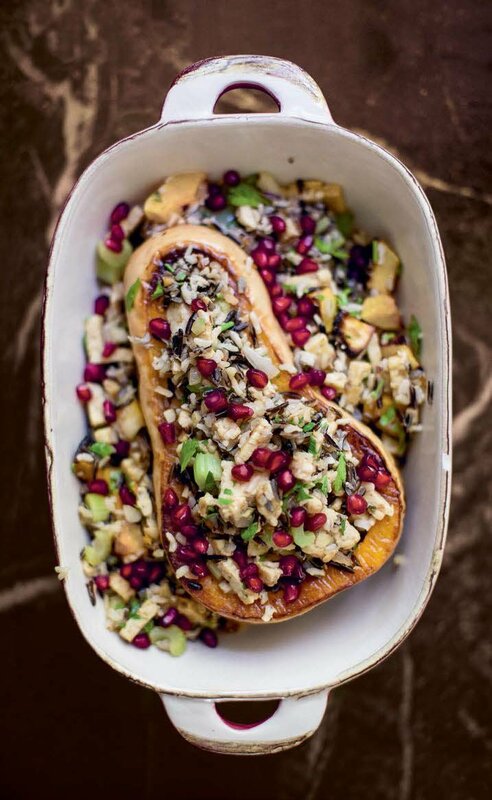 19Top with pomegranate seeds, slice into 4 equal portions and serve.